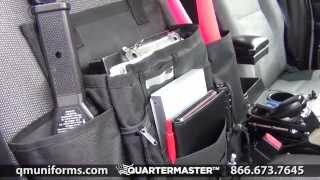 Turn your front seat into a mobile office with the LawPro Car Seat Organizer. 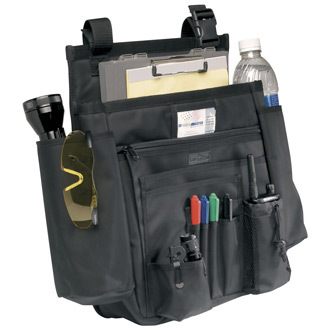 Built from rugged 1200 denier PVC-coated black nylon fabric for years of dependable use. 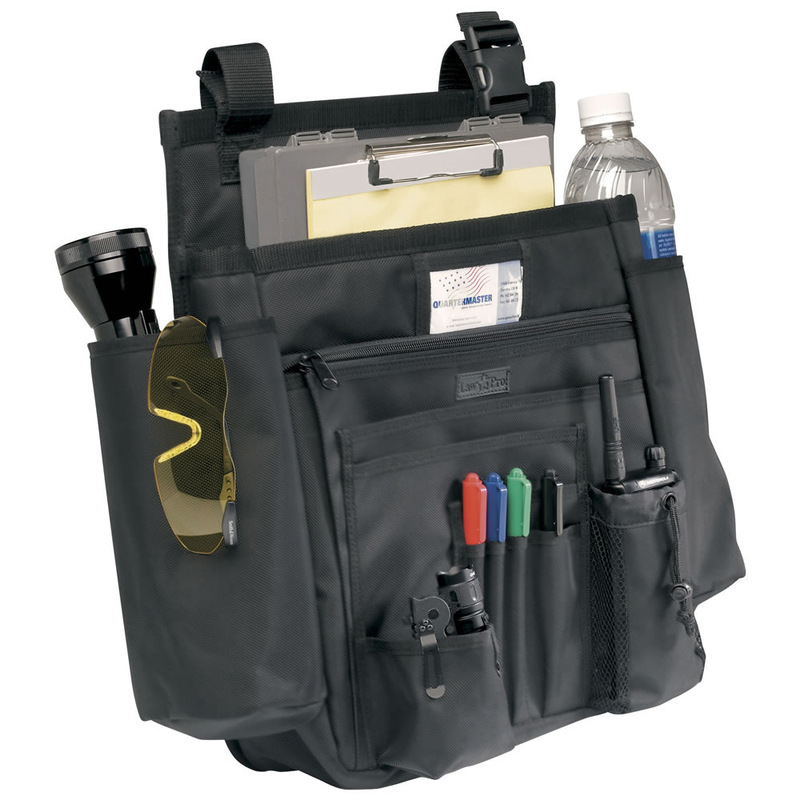 Keeps paperwork instantly accessible, with pockets to store whatever you need to keep handy. Adjustable strap secures the organizer to headrest and serves as a shoulder strap for convenient carry outside of the vehicle. The car seat organizer is 14"W x 5"D x 18"H with the pockets on each side, and at least 5" deep. I've only had this for a week but so far so good. It looks well put together. One issue - the business card holder on mine is way too small to hold cards- maybe I just have a defective one. Also be aware that the side pockets are very deep - a 1/2 liter water bottle completely disappears. So, what I did is to fill the bottom of the pocket with blue latex gloves which I need anyways, so it worked out OK.
this is my second car seat organizer, which means it really does the job for me. the first one was stolen out of my car so I guess the thieves needed to organize their car too. I used multiple kinds of bags that sat in the right front seat. Whenever I would pull out one folder or posse box or notepad, the little items that were placed along the sides would always fall to the bottom because it was one large opening. This would prevent a smooth and quick stowage of my gear and basically irritate me. The car seat organizer holds as much stuff as I had in the other bags, but it's set up for quick and easy use. The only downside is it's open to the top and front so some rain or snow could blow through the door into it when opened during in-climate weather. Great Product. Well made, heavy duty construction. Great buy. Clears up the clutter and puts it into a nice neat package, and when you need to just grab the bag and go mobile and take everything with you. Really handy seat hanger. Keep a flashlight, ticket clipboard, spare notebooks, cell phone, a couple books, miscellaneous paperwork and on in it. Really secure, height adjusment lets you use the seat for other stuff. Easy/quick to remove when you have a passenger and keeps your gear off the floorboard!! I rent cars 3 weeks out of 4. This is a fantastic seat organizer that I grab out of my personal vehicle and transfer to the rental. What is in it? The side pockets hold a tube of Clorox wipes and a small umbrella. Interior pocket holds my travelon organizer bags that hold the GPS, cords, E-Z pass and power adapter as well as the GPS holder, my sunglasses, blue tooth phone head set, electronic tablet with a keyboard, pads of paper, pencils and even a coin purse. This doesn't even begin to fill the organizer!! And the best part is that it attaches to the headrest and detaching it and throwing it over my shoulder to go is very easy. I have referred this to any business person who is a road warrior and wants to stay organized without everything sliding to the floor!! I ordered this organizer so I could have a little more area on the front seat of my cruiser. It holds everything that I need to help perform my duties. Even if I change the height, I could place another bag on the seat below it! This works perfect. Excellent addition to my vehicle. Got tired of picking things off the floor if I had to brake hard. Keeps everything organized and neat. Perfect addition to any emergency vehicle.... A must have! Excellent addition to your patrol vehicle or person vehicle. Very surprised and impressed with its construction. It is like a huge high-speed file cabinet for your vehicle. I've been using the bag for the last two months. For the price, you cannot beat this bag. It has space for all the items I need for my day to day patrol activities. If you're looking for a good bag, you can't go wrong with this. Excellent item. Holds equipment well and keeps things available for easy access. I had this for about a year now, the only down fall is if it is moved around a lot taking it in and out of cars the seams are starting to tear. Other than that, this item is a must have in every patrol unit.